Travis Zajac is the alternate captain for the New Jersey Devils of the NHL. Zajac wears the "A" during home games (his teammate Andy Greene wears the "A" during away games). Zajac was selected 20th overall in 2004 by New Jersey, the organization he has played his entire NHL career with. On January 16, 2013, Zajac re-signed with the Devils, committing to an eight-year, $46 million contract. On March 31, 2014, he recorded his first career hat-trick against Florida Panthers. 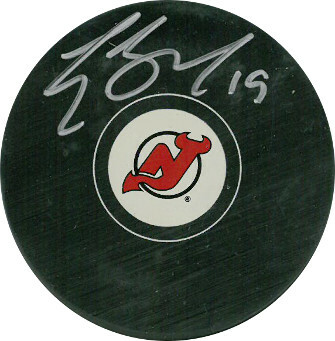 Travis Zajac has hand signed this New Jersey Devils Hockey Puck. Leaf Authentics Hologram and Certificate of Authenticity from Athlon Sports.